Google Analytics is a great tool for showing how visitors to your site interact – what pages visitors read, how long they stay, where they come from, and complete any goals you set up. However, as you mature with your Analytics usage, you will realize that while every user is unique, many times visitors will likely fall into natural patterns and groupings. These groupings can based on any number of Analytics metrics, and can yield significant insight into our users. We call this action segmenting. Segmenting your visitors can yield amazing insight into patterns or untapped data. They can help to filter out noise from meaningful statistics. Segments are displayed at the top of the Analytics screen. By default, Google Analytics will display “All Sessions”, which is essentially everything and nothing filtered or segmented. This is one of many segments that come pre-defined and ready for use in Analytics. To add a new segment, click the “Add Segment” section and a screen will appear where you can add new segments. You can see there are some segments pre-defined. In addition, you can create your own segments, and star them for fast retrieval. If you wish to remove an active segment, click the down arrow icon in the upper right of the segment, and select Remove. In addition to the “All Sessions”, Analytics comes with other segments that are immediately useful for most users. You can have up to 4 segments shown at once – segment wisely! It’s clear that Analytics comes with a lot of ways to slice up visitors and traffic – but you can always create your own custom segments. Now it’s time to see how we can segment our visitors and glean useful information about them. We will take a look at some of the included segments with Analytics. There are tons of ways to create your own, but that’s for a future blog post! For now, we’ll take a look at some specific scenarios. From this, we can clearly see that the Mobile Traffic segment is down in some key areas of the site. Pages / Session, Average Session Duration, and Bounce Rate are all negatively affected with our Mobile Traffic. With the Mobile Traffic segment representing nearly 27% of our overall sessions, we clearly want to address this. In this example, it turns out that the site was not mobile-friendly or responsive, and we now have a business case for creating a mobile-friendly site. This isn’t something that Analytics would have told us naturally, but by asking Analytics the right questions and dividing up our users correctly, we can identify that our mobile user’s experience needed improvement. In this example, we’ll take a look at All Sessions versus Converters, or rather, visitors that have completed an Analytics Goal. Wow, we can clearly see that those that convert have a significantly higher Pages / Session, and Avg. Session Duration. I’m a bit curious where these converters are coming from. So I’ll visit the Acquisition > Channels section, and let’s look at that data in a pie chart view to get a better visual sense. Very interesting! I can see that my Direct traffic is one of my best for generating overall sessions, but it’s not doing great at converting – it only has 16.36%. My Organic Search and Paid Search are rocking – they are generating over 70% of all of my leads! I can also see that Social is getting some traffic, but it’s not converting – this means I have some work to do there to connect more with my followers. We need to do more work on our Direct channel and determine how users are finding us (traditional advertising, brand mention, etc), to see what can be done to improve our conversions there. We need to continue with our Organic Search efforts (like Evergreen Content) as they are holding steady. Whew! That’s a lot to do! If we didn’t segment our converters out, we may never have known about this list of things that we could work on to improve our site. Segmentation of your visitors takes time to analyze and dig in. The data is there, but it has to be discovered. You’ll need to look at it from different ways to see if you can make the data mean more. Ask Analytics The Right Questions! Examples like “How are my mobile conversions doing?” can start you down a path to discovering more about your mobile users. There Is No Magic Segment! The examples above may be useless to you, but there is a segment that will have meaningful data – you have to find it and apply it. Create A Dashboard To Monitor! Once you identify the problem (and have a strategy for improving it), create a custom dashboard to easily observe your results in Analytics. 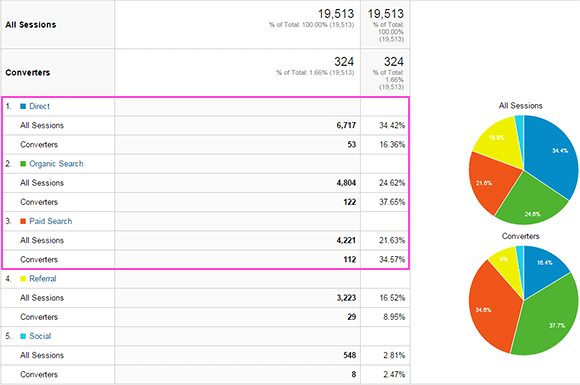 Got a tip about Google Analytics segments, or a question about how to use or interpret them? Submit a comment below!